I have followed the instructions and filled in the info on the DataSources and Drivers to the best of my knowledge. I did a drag and drop of the database name from myphpadmin Databases screen to the Database: box, which put the address http://localhost:8080/phpmyadmin/db_structure.php?token= big long string =sandboxdb in the form. When I click OK, I get "connecting to database... " and a progress indicator, but no connection. It seems to be looking for a password, but I have not set up any passwords for the database. I'm a student starting an intro to databases course where I'll be learning SQL and PHP. I just need a sandbox to play with. Can someone help me to get this setup? 1) Please provide screenshot of your database settings (in PhpStorm). http://localhost:8080/phpmyadmin/db_structure.php?token= big long string =sandboxdb in the form. This makes no sense for me, at all. 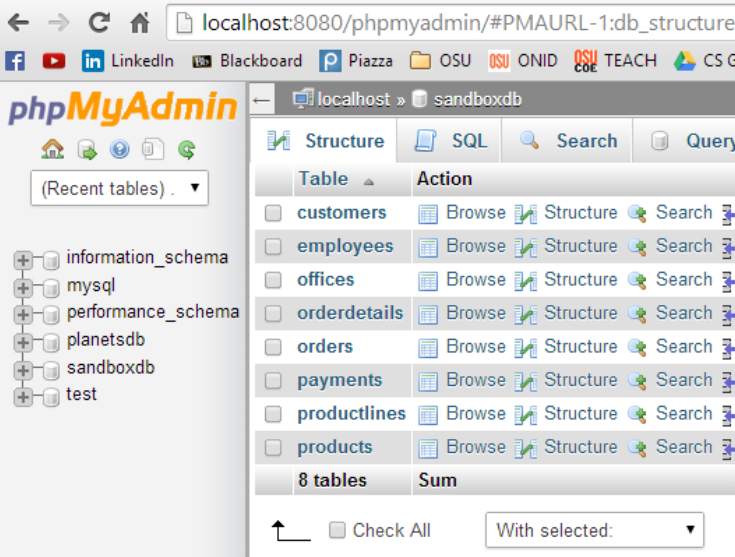 Why database name should be an URL of your PhpMyAdmin web page?? http://confluence.jetbrains.com/display/PhpStorm/Installing+and+Configuring+XAMPP+with+PhpStorm+IDE#InstallingandConfiguringXAMPPwithPhpStormIDE-IntegratingtheMySQLserver -- this is for XAMPP but Database toll window is the same for any stack. I just dragged and dropped the sandbox db on the left to the PHPStorm database box in the first image. The "Database" field should be your database NAME -- "sandboxdb" as I understand (as per 3rd screenshot). And port should be your MySQL port (usually "3306") and not your web server port (8080). Gah! Sorry. I fixed that error, and it still isn't working. Do you need to see the error message? Screenshot (the same as 1st one) and first few lines of the exception. But before that -- check DB Name spelling -- make sure it uses the same letter case. I did verify the correct spelling and capitalization (there is none) for the database name directly from phpMyAdmin database page. In PhpMyAdmin -- check users/access rights section. Check how your "wfws" user is defined -- what host(s) it can access from. Also check Windows firewall (if MySQL is allowed to receive connection on TCP 3306 port) -- PHPMyAdmin could be accessing DB using different transport. nged the name to root, and presto, she connected. Thanks so much for your patience. I imagine after a few hundred of these connection issues that have very little to do with your software, it might become a little bit exasperating to step yet another person thru this. Now I can go and enjoy learning PHPStorm and my Intro to databases course.